Married couples (N = 172) were observed as newlyweds and again one year later while engaging in 2 problem-solving and 2 personal support discussions. Microanalytic coding of these conversations was used to examine associations between problem-solving and social support behaviors over one year and their relative contributions to 10-year trajectories of self-reported relationship satisfaction and dissolution. Results demonstrated that initially lower levels of positive support behaviors and higher levels of negative support behaviors predicted 1-year increases in negative emotion displayed during problem-solving conversations. Emotions coded from the initial problem-solving conversations did not predict 1-year changes in social support behaviors. Controlling for emotions displayed during problem-solving interactions eliminated or reduced associations between initial social support behaviors and (a) later levels of satisfaction and (b) relationship dissolution. These findings corroborate models that prioritize empathy, validation, and caring as key elements in the development of intimacy (e.g., Reis & Shaver, 1988), and they suggest that deficits in these domains foreshadow deterioration in problem-solving and conflict management. Implications for integrating support and problem-solving in models of relationship change are outlined, as are implications for incorporating social support in education programs for developing relationships. Copyright © 2010 American Psychological Association. This article may not exactly replicate the final version published in the APA journal. It is not the copy of record. Sullivan, K.T., Pasch, L.A., Johnson, M.D., & Bradbury, T.N. (2010). 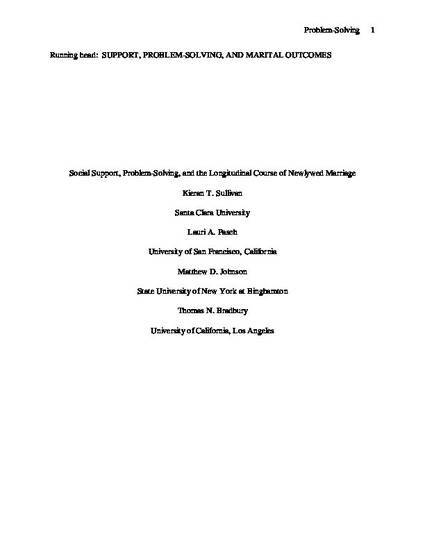 Social support, problem-solving, and the longitudinal course of newlywed marriage. Journal of Personality and Social Psychology, 98, 631-644.